Do not worry; this is not a prescription of a person suffering from any acute illness, but that of celebrity wildlife photographer, Richard Kirby. He was here in the Northeast filming for ‘Off the Fence Production’ with Help Tourism. He was in his last leg of shoot and was tired with aching body, cough and cold due to the changes in temperature from time to time and few other ailments because of the hectic schedule. The herbal centre took care of him. He has taken an oath to come back to Tripura for the Panchakarma massage and the spectacled monkeys in Sepahijala. Sepahijala is a wonderful wilderness setting within less than 25kms from Agartala which houses the key species like spectacled monkey and clouded leopard in the wild, as well as in the zoo. It is fairly well maintained inspite of several villages around the 18.5 sq kms wildlife sanctuary and 68 hectares of zoo area. There is an extension into a botanical garden, which houses the Panchakarma Herbal Centre on the Kerala model of herbal treatment and massage. There is a well set accommodation facility with well meaning staff. All combinations to make it a world class ‘conservation tourism’ destination. Highlighting Agartala as the base is not viable enough to make Tripura an international destination; it is the same for almost all the state capitals of Northeast. Tourism circuits have to be developed beyond the capital. The complications of accommodation for nighthalt at Sepahijala have to be sorted out, or even for other interesting sanctuaries or parks like Trishna, Rowa etc. The 10am to 4pm park open system will only attract dating couples and not nature enthusiasts. A proper ‘conservation tourism’ or ‘ecotourism’ policy with master plan has to be in place to achieve results. It is not that the Tripura Government is not spending on conservation and tourism, but the lack of proper policy and plan has kept Tripura off the conservation and tourism circuit of the Northeast region, National promotion or International attention. Atleast to start with Sepahijala, we must adopt the concept of providing service in ‘Jungle Plan’ (JP), which is practiced in several popular protected areas in Asia as a policy. We also have to put our house together with capacity building for tourism services with people in and around the park. Plan aggressive market linkage after product has taken shape. This can be the first model, beyond the conventional thinking of five star accommodation or urban tourism infrastructure. Accordingly, other areas can be put under the first models. 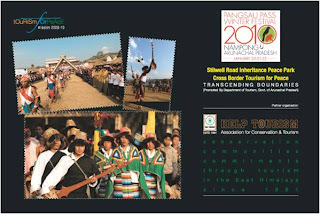 Tripura has several festivals all through the year, unfortunately none of them are branded for International Tourism Festivals. For such events we need to have fixed dates year after year, we have seen the results achieved with the Hornbill Festival in Nagaland and Pangsau Pass Winter Festival in Arunachal Pradesh. Jampui Hills in North Tripura can be the venue to restart with the ORANGE FESTIVAL, on fixed dates towards the middle of November. This has to be promoted as an Ecotourism Festival to nurture Peace and cross-border relations with Assam and Mizoram in the country and Internationally with Bangladesh and Myanmar. It has to be organized locally, guided by NGOs, supported by the Governments at the state and centre and promoted by the tourism industry as a whole. To break the ice, an International seminar on ‘Ecotourism’ is of immediate need. If any individual or organization (Government or Non-Government) who has sincere interest in collaborating or organizing the same may contact email: atishdipankara@gmail.com or leave a comment here with contact details.